Nanaji Deshmukh Veterinary Science Admission 2018 will be done on the basis of marks obtained in NEET 2018. The Nanaji Deshmukh Veterinary Science University, Jabalpur was established on 3 November 2009 under the Madhya Pradesh Act No. 16 of 2009. The University has three constituent Veterinary Colleges located at Jabalpur, Mhow and Rewa, and Centre for Wildlife Forensic and Health and Animal Biotechnology Centre located at Jabalpur. The main objective of this University is to provide the advancement of learning and prosecution of research in veterinary and fisheries sciences. 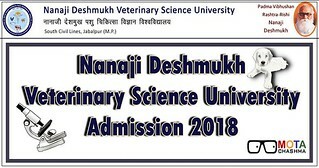 Get the complete details of the Nanaji Deshmukh Veterinary Science Admission 2018. AIPVT is a veterinary entrance exam that was held till last year for admission to 15% of the total number of seats in Veterinary Colleges in India (except J&K) for Indian Nationals. Earlier MP Veterinary (PV&FT) exam was conducted for admission in B.V.Sc. & A.H programs in Nanaji Deshmukh Veterinary University. From 2017, the admissions will be on the basis of AIPVT scores. The duration of B.V.Sc & A.H degree course is 5 years. The course also includes a compulsory rotating internship of six months. Nanaji Deshmukh Veterinary Science University also offers 4 year's full-time graduate program Bachelor of Fishery Science (B.F.Sc.). Counselling Schedule and Counselling process in detail has been discussed below along with the Document Verification Centers address. Candidate must be in the merit list of Entrance Exam. Candidates who have studied in Madhya Pradesh for continuously three years (between 2014- 2018). Nanaji Deshmukh Veterinary Science Admission in B.V.Sc & A.H will be done on the basis of marks obtained by the candidate in AIPVT. AIPVT is a veterinary entrance exam that is held for admission to 15% of the total number of seats in Veterinary Colleges in India (except J&K) for Indian Nationals. NRI and Foreign Candidates need not appear in AIPVT. NRI candidates will have to fill the separate application form available on the official website of Nanaji Deshmukh Veterinary University, Jabalpur. Admissions on the seats of NRI and foreign candidates will be done on the basis of merit list prepared based on aggregate marks of Physics, Chemistry and Biology obtained in Class 12. 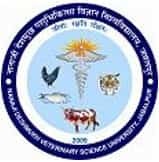 Application fee has to be paid by Demand Draft to the Dean, Faculty of Veterinary Science and Animal Husbandry, Nanaji Deshmukh Veterinary Science University, Civil Lines, Jabalpur, Madhya Pradesh-482001 (India). *Tuition Fee of Second Semester Included. STEP 1: Applicants have to firstly apply online by following the link given below top the counselling process. Applicants will be provided with User ID and Password after the registration on SMS/Email. STEP 2: Applicants have to now fill the choices and preferences of the colleges. Choices to be filled by the applicant must be minimum of 1 choice and maximum of all the choices. STEP 3: Applicants can edit their choices as many times as they want but before the locking of the choices. STEP 4: Applicants have to pay the application fees of Rs 180 before locking the choices, which can be paid online only via Internet Banking, Debit/Credit Card only. It is advised to the candidates to keep a copy of their fee receipt for future references. STEP 6: Applicants will be allotted seats online according to their merit in AIPVT examination. University will prepare a common merit list of the candidates that can be accessed using the login ID and Password on the portal. STEP 7: Reporting to the respective allotted college is to be done by the candidate along with the admission fees on the dates as per the schedule is given at the starting of the page. Class 12 Mark sheet along with the ID Proof. 4 Recent Passport size photographs with name of the applicants on its back. Caste certificate duly attested by the competent authority. If there is a gap after class 12 applicants have to produce their affidavit of that period. All India Seats: 15% seats in all the three colleges will be filled by NEET conducted by Veterinary Council of India and the seats would be allotted on the basis of counselling conducted by VCI. Remaining Seats: Last year 85% of seats were also be filled on the basis of AIPVT and the distribution of seats was as follows. These seats would be reserved for only the students of Madhya Pradesh. The seats would be distributed on the basis of counselling conducted by Madhya Pradesh Government. If NRI seats remain vacant after the last date of application, they will be filled by the candidates of merit list of Entrance Exam.